This is another project from Harvard Extension School's Book Art class taken during the spring of 2005 (see Familiar Storefronts in My Town). What Shall I Cook Today resulted from the altered book assignment. 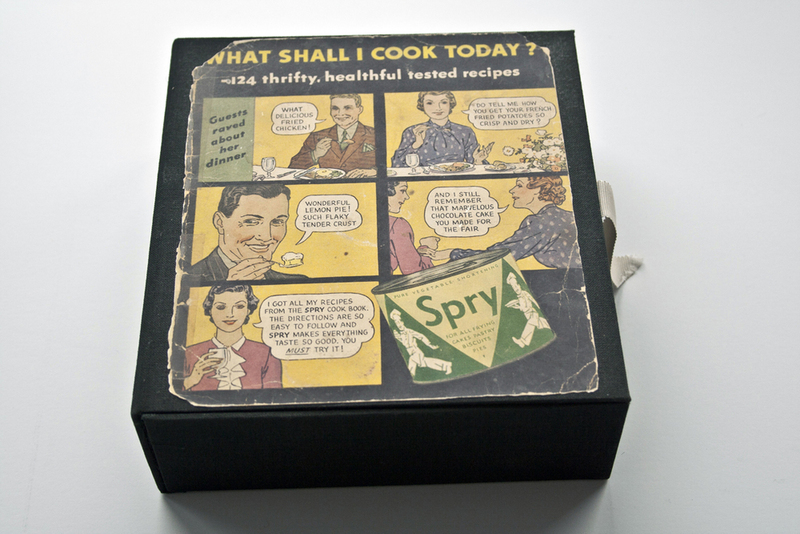 Years earlier my pal Carol had given me a Spry baking pamphlet from the 1950's. She had 2 copies and shared 1 with me. Her mom had written notes about the recipes she tried on some of its pages. For the assignment I carefully disassembled the pages and worked from scanned copies. I used the wire binding I learned from Daniel Kelm's weekend workshop for the rebinding of the pages for the project. Each reassembled page has a fold out with text on its underside, matching the font of the pamphlet and describing a food related memory from my childhood – all brief recollections, 24 in all and listed below. Children of the 1960's will likely relate. My mother heated Beef-a-Roni for our dinner so often that it became a joke with the neighbors. When Gerry Curtain entered our house he sang the jingle from the Beef-a-Roni television commercial. Every morning when my grandfather left for work in the morning he called back to my grandmother asking what they were having for dessert that evening. Preparing dinner and this dessert took up much of her day. My mother grew to hate the ritual. When she had a family of her own she never baked. She doesn’t eat desserts either. My grandmother baked chocolate chip cookies for me often throughout the year and especially on my birthday. She lined a shoe box with foil and filled it to the top. I kept the covered box in my room and the cookies disappeared quickly. As an adult, I’ve tried to match the chewy crispness of her recipe, but have not yet got it quite right. On Wednesdays we had early dismissal from school. When I got home I made myself a fried egg sandwich and ate it in front of the TV. I enjoyed watching Father Knows Best and Dr. Kildare before homework. My mother packed my lunchbox with a sandwich, a thermos filled with chocolate milk, and a striped paper straw that bent at the top. She stored the straws on the top shelf of kitchen cabinet above the sink. One day at school, I found tweezer bugs floating in the milk after I drank. They had been hiding in the straw. I didn’t know if I had swallowed any of them, but I sure hoped not. My mother has fond memories of the salmon loaf her mother made during her childhood. I found the recipe recently, stored in my grandmother’s tin box, now kept in my kitchen. When I showed it to my mother, she enjoyed reading and remembering, but did not want to make the recipe. The ingredients called for butter. I’m told that during Thanksgiving preparations in 1959, as my grandmother pulled the turkey from the oven it slipped from her hands and slid across the kitchen, stopping as it hit the wall. Everyone watched in shock then calamity ensued. Finally everyone laughed and laughed. The story’s become a family legend. My grandfather and great aunt Hilda fought over the part of the turkey that “went over the fence last,” each thinking they were most deserving of the delicacy. Dad marveled at how Nanny could serve so many dishes at once, all piping hot from the oven. On some weekends I would sleep over at my grandparent's house. In the morning Nanny made “delicious toast” for me — white bread toasted with butter. I’m not sure why this simple recipe tasted better at her house, but everything did. Ketchup on rice was a favorite as well. Backyard cookouts were a favorite pastime during the summers of the early 60’s. The neighbors came by for hamburgers and hot dogs on the grill. Our parents drank beers and we drank Cokes in bottles then. I prefer Coca Cola in bottles even now. Bev’s dad was a salesman. His home delivery truck was filled with food staples, such as flour, sugar and cake mixes. Each day we stole into his truck and absconded with a different mix flavor. Our summer morning was spent baking the instant cake and frosting it from a can. Afterward we sat and ate a slice or 2. During lazy summer days we swam and tanned, played fish and war card games under hand-made tents, and, too often, raided our families’ kitchens. Dad asked me not to feed the neighborhood. The next day he reminded me of his request when he found us trooping, single file, down the front walk, each with our own peanut butter and marshmallow sandwich. “God dammit, Debbie!” I can still hear his voice. My friends scattered. We still laugh when we talk about this day. My father enjoyed eating cheese and crackers at any time of the day. He shaved the cheese block to match the cracker size. When stacked they formed a neat little square. Unlike many moms of the day, mine worked outside of the home. With time limited, she created efficient routines for household and family tasks. On Saturdays she would make spam and cheese sandwiches for the week and wrap them individually in plastic wrap. Each weekday dad would pluck one from the freezer for his lunch. It would thaw by noontime. On weekends I woke up before my parents. Bozo, Boomtown and Sky King hummed on the TV, while I ate lemon danish pastry and colored in my book. The local bowling alley had a dinner counter which specialized in Italian food. The best Saturday nights were spent in rented shoes eating spaghetti with red tomato sauce. One year Santa brought me an Easy Bake Oven. It came with 2 miniature pans and 4 cake mix flavors. The oven heated with a bulb. Somehow the temperature was sufficient to bake these small cakes, which I then frosted from a little tin. When I was a child, I had a dish set with plastic parts that snapped together to form a clown. This yellow and orange breakfast set was made up of a salt shaker hat, an egg-cup head, an inverted cup torso with arm handles, and a cereal bowl belly. All sat atop a saucer base that kept it standing upright. My mother had ordered it from a cereal box-top. Although remembered through the haze of childhood, I came upon it once again while on a search of EBAY. For 35 dollars, I once again possess my beloved breakfast set. I look at it now on my kitchen shelf. One Sunday afternoon my grandfather dropped by our house unexpectedly — he was in the area doing errands. Mom was pleasantly surprised and asked him to stay for dinner. “We’re having sandwiches!” she said. “Sandwiches!” he responded. “Oh, no! Never on Sunday,” and home he went to my grandmother and her ritual dinner of meat, potatoes, 2 vegetables, and of course, dessert. Each morning my grandfather put on a good suit, polished shoes, and top hat, and began his work day. After daily chores were done, my grandmother styled her hair, applied lipstick, and slipped on her proper dress, stockings and high-heels. At day’s end she greeted my grandfather with a home-cooked meal, that they ate in their formal attire. They kept these clothes on all evening long, until bedtime, just in case someone dropped in for a visit. Pizzi’s Sub Shop was a small sandwich store located about a quarter of a mile from my house. We used to stop there after school and spend our allowances on soft drinks, snacks, and candy. On weekends, my father would sometimes send me to buy his cigarettes – unfiltered Camels – for 35 cents. A set of 3 egg cups sat on my grandmother’s kitchen shelf. They were painted, each with face and clothing, representing a mother, father, and son. I wish I had paid more attention as we dismantled her house after my grandfather died. I only managed to retrieve one, the son, and the others have been lost to me since then. Sometimes I look for them on EBAY, but the search is hard to define. They were likely purchased decades ago, at the 5 & 10. Dad found a small tin coffee pot and brought it home. It was the same kind he had when he was in the Navy. He gave me a lesson in coffee-making using the small pot and heat from the oven burner. We measured the water and coffee, then timed the percolating, gauging its done-ness from the intensity of its color. Once I learned, we took turns making it for each other in the evenings after supper. One evening Dad and I made fudge from scratch. We let the chocolate and sugar boil and tested its texture by dropping small amounts into a cup of water. He told me stories of making fudge with his siblings when he was young. They would all stare drooling into the pot, he said, as they took turns stirring.